This recipe came from my cousin Connie. It is a warming winter dish and quite economical. The technique is similar to the Russian Sauerkraut Soup recipe I posted a few years ago. I like to make this soup fairly thick like a chowder. If you prefer it more brothy, reduce the flour for the roux to 1/2 cup and add more water. You could include sour cream and bacon as well. If you have leftovers and chill it overnight the soup will be very thick. Reheat the soup with a bit of chicken stock or water and it will be a nice consistency. Begin the soup by placing cubed potatoes in a 5-quart pot. Cover with water, then add 1 teaspoon kosher salt. Cover and bring to the boil over high heat. Cook the potatoes 15-20 minutes until fork tender. Remove 2-1/2 cups of the potato water and set aside. Drain potatoes and roughly mash so you have 3 cups of mashed potatoes. Set potatoes aside. In a 4-quart pot melt butter over medium-high heat. Add onions and sauté 10-15 minutes, stirring often until the color of straw, medium golden. Slowly sprinkle in flour, stirring constantly with a wooden spoon to make a roux. When the flour is golden, slowly add the potato water and stir until it thickens to a sludgy paste. Add some salt and pepper. Whisking constantly, slowly add the 6 cups of water and whisk until smooth. Add the bouillon cubes. 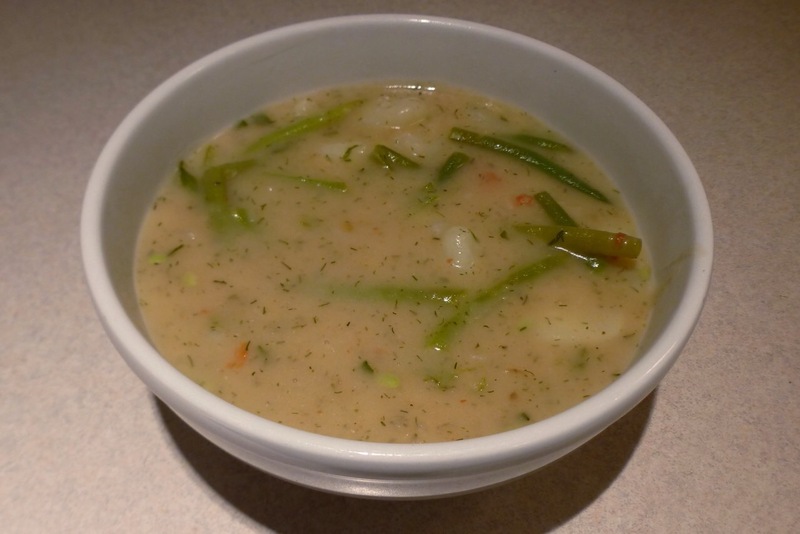 Bring to a boil and when bouillon cubes have dissolved add the mashed potatoes, cooked green beans, and tomato. Add herbs and salt and pepper to taste. Bring to a boil. Cover and let simmer on medium low heat for 15-20 minutes to allow flavors to blend. Serves 4-5. This entry was posted in Soups, Vegetables. Bookmark the permalink.